Don't equip anything else since this is a hotspot for low-level PKers. In the client, click View > Items with Glory(6) and Glory (5) in your inventory. The ID will be listed above the item. Updated. Version 0.2: added support for Glory(5) and Glory(6). EDIT: it doesnt turn camera to bank, i have to zoom all the way out or manually turn my camera. https://ibb.co/N32L0WG - i took a screenshot of the script, ran for 2 hours and 40 minutes, check out the progress! I need more info than "doesn't work." What do you mean it was "broken"? I need details. Fixed. It will switch to the inventory tab before attempting to equip the Glory now. The bot works perfectly, there is only one small bug, it happens when he uses the teleport to edgeville from the altar of obelisk .. 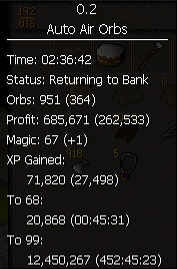 The bot is left clicking I suppose to the roof of the bank and it does not enter to save the orbs and fill its inventory again, so I must do it manually.